Today is Martin Luther King Day in the United States. Martin Luther King, Jr. was born January 15, 1929. He was a Baptist minister and a prominent civil rights advocate. King was the youngest person to receive a Nobel Peace Prize when it awarded to him in 1964. 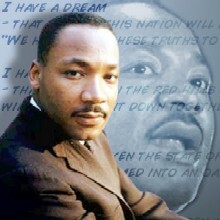 He was assassinated April 4, 1968 in Memphis, Tennessee. One of his most famous speeches was delivered at the Lincoln Memorial August 28, 1963. Often referred to as the “I have a dream” speech, it is one of the most significant and powerful speeches of the 20th century. A portion of the speech follows. Links to the full speech and an audio file are at the end of this post. The full seventeen minute speech is here.